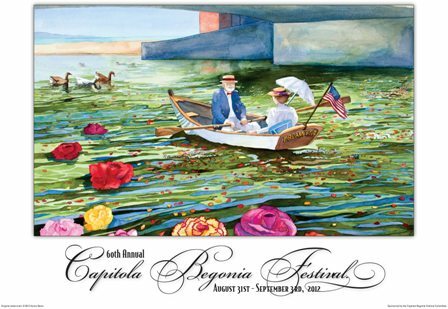 The Capitola Begonia Festival began in 1951, and became an official annual event in 1954. The festival features dozens of floats, solely decorated with begonia blooms and other fauna. The homespun Capitola Begonia Festival has its roots in the moist, cool coastal climate of Santa Cruz County, California, which is eminently hospitable to the tuberous begonia. Major begonia growers were located in Capitola and Santa Cruz in the mid-20th Century, and a festival in late summer--when the begonias are in spectacular bloom--was a natural way to extend the late-summer coastal tourist season.